Intellectual Property Law Blog contributor Josh Escovedo was recognized this week as a Top Author for the topic of trademarks in the JD Supra 2019 Reader’s Choice Awards. Josh Escovedo practices in Weintraub’s Litigation and Intellectual Property sections. He counsels and advises clients in a variety of litigation matters with an emphasis on intellectual property, commercial, and real estate litigation. Josh also provides his intellectual property clients with advice and counsel regarding trademark and copyright usage, registration, acquisitions, and transfers. Josh writes frequently for this blog, on a wide range of IP topics. His topical and accessible posts about developments in trademark law are the body of work recognized by JD Supra. He also regularly publishes articles concerning copyright law. JD Supra delivers need-to-know legal and business content to professionals on multiple platforms across the web. 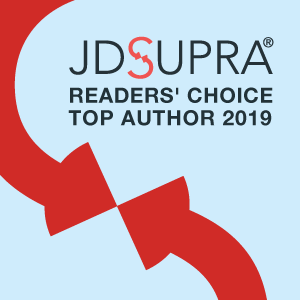 The Readers’ Choice Awards recognize top authors and firms who were read by C-suite executives, in-house counsel, media, and other professionals across the JD Supra platform during 2018. The awards recognize authors for their visibility and thought leadership covering 26 key, cross-industry topics, including trademarks. Editors chose the topics covered in this year’s Readers’ Choice Awards for their timeliness, as well as their proven, ongoing importance. In each category, ten authors and one firm were recognized for consistently having the highest readership and engagement within that category for all of 2018. Across all categories and 50,000 contributors, 228 authors were recognized for excellence and achievement.